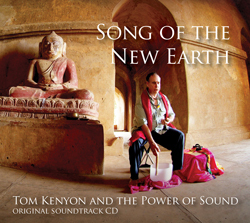 This is the soundtrack from the movie Song of the New Earth: Tom Kenyon and the Power of Sound, Tom is a composer, teacher, musician, singer, author, psychotherapist, brain scientist and certainly one of the most respected sound healers and alchemical teachers in the world today. His almost four-octave voice is stunning, and it transforms consciousness though his mastery, artistry and genius. Please note that this CD includes a 15 minute version of the Song to Gaia, which appears at the end of the movie. But the complete Song to Gaia is thirty minutes in length and can be found in the single CD Aethos or the workshop set The Sphere of All Possibilities.